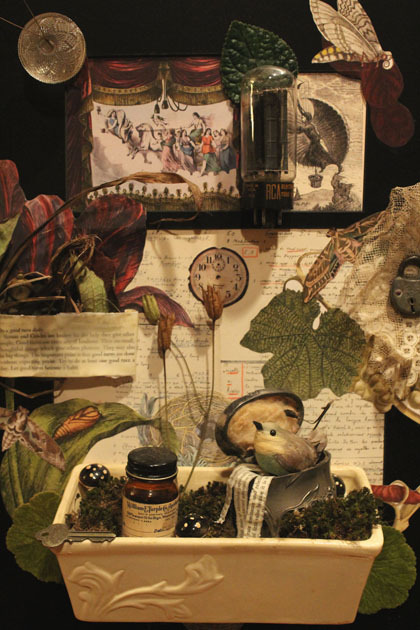 In my latest body of work, I have moved into the realm of assemblage. Taking inspiration from nature, childhood, and the objects themselves, I continue to create small worlds to delve into. It’s never quite certain what you will find, as there are many layers to peel through. Also in this new work, I am taking images and objects out of their borders and letting them overflow onto the mat and the frame. Combining two-dimensional work with three-dimensional assemblage is something I’ve been thinking about for quite some time and have finally come up with the right mixture. Dreamlike and strange, antique and natural, you will find it here. Read the text, it explains a few things. Most of all, enjoy this peculiar new world that I’ve created.